What is the best fitness infomercial? Do we really need another one? 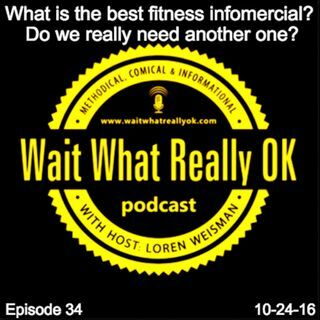 Wait What Really OK Podcast Episode 34 hosted by Brand Precision Marketing Strategist and Counselor, Loren Weisman, talks health, cardio, weightlifting and fitness with Ocean Drive Elite Physiques Manager and Owner, Chris Gurny. 25 years in the health and sports industries spanning baseball to bodybuilding as well as anatomy and physiology to physical therapy and nutrition, has all culminated in to Chris Gurny’s ... Más informaciones personal training approach, bringing the widest array of the most effective health and wellness variables for each person and their personality. Chris talks about the realities, the myths, the truths and the honest of being fit. Health and wellness is not a one size fits all, cookie cutter model like many have tried create in the fitness industry. He also discusses his Personifit method. What is the best fitness infomercial? Do we really need another one? Ep34 of the Wait What Really OK Podcast is available on iHeartRadio or Spreaker. Podcast Blog Supplement for Episode 34 of the Wait What Really OK Podcast with Loren Weisman. Podcast Link Supplement for Episode 34 of the Wait What Really OK Podcast with Loren Weisman. Vero Beach Fitness Trainer, Nutritionist and Wellness Counselor. Podcast Video Supplement for Episode 34 of the Wait What Really OK Podcast with Loren Weisman. Podcast Photo Supplement for Episode 34 of the Wait What Really OK Podcast with Loren Weisman.